Justin Hayward - Moody Blues appeared at the IOW festival 1970 and performed on Sunday - same day as Tull appearing as the act before them. video of a raw performance of Knights...I'm not that familiar with Moody Blues other than owning In Search of the Lost Chord but this is the first time I've seen and heard them perform as what they started out - a college band minus the jazzy suits and the slightly over- polished performances - I prefer this version. There is someone going to the Christmas Concert in Manchester the next 19 December ? I bought the ticket, today. It would be good to meet who from the Forum will be there. M.
I find this markedly more disapointing than the TAAB/Aqua stuff, for the simple fact of the inclusion of those other 2. Greg Lake and some of his dreamy material did not exactly fill me with joy either, last year I think. And the Iron Maiden guy, (I am aware of an element of Tull fans, which I can nearly guarantee would be 95 percent under the age of 52) actually somehow find merit in both Iron Maiden and Jethro Tull. Have you looked at the covers to their albums. Looks like the kind of stuff I would expect to see on the most sugary kiddy candy on the market. I will need to be reminded whats good about them, that one of them likes Tull, or that they performed, hopefully, the most wretched cover of a Tull song ever? And the freaking Moodies, saccharine to the bone, with MAYBE a couple songs excepted when their brains were well bathed in lysergic, but for god's sake, even moreso than Greg Lake's Lucky Man, Ian, somehow find a way out of not playing on Knights in White Satin. I mean, whats next, Styx? You've already done one with Toto I think. Where's that Grimminelli dude to give the proggers something to really complain about. Or even that Porcupine dude who helped with the sound on the all new Aqualung would be a huge uptick. To the extent a guest is needed their guest should be a constant, Fairport Convention. As I said I've never been a great fan of the Moodies and I've never heard an Iron Maiden song either. The only redeeming feature is looking back at the kitsch 1960's pics of the Moodies who look like someone's uncle who works at a bank during the week and then dresses as a hippy at the weekend and makes a hash of it. So much of my feelings about the Moodies and others is, frankly,just outright bitterness for my own perception of Jethro Tull having been used as a doormat for so many years, when there were far more worthy applicants, say, the Moodies. I mean those bits on their records, which occured on all of them that I heard, where the one guy, don't want to know his name, will start intoning some crap about the white eagle of the north being overhead, no wonder people hate their own perceptions of hippies. Tull frequently got stick for the likes of the Hare, even here within Tull land, while I hardly mark it as any kind of masterpiece, or the record which holds it as most know, but at least it was historically accurate to actual Passion Plays, having the one goofy bit in the middle before getting back to the Dante junior stuff. But as to the preservation of those exquisite buildings, who possibly cannot be in favor of that. Having said that, all these places he is playing in are very major historical institutions, I would be surprised if they do not receive signifigant aid from the UK government, as historical spots most normally do, but I also would not be surprised if its not enough. And Salisbury, where he is playing one I have had the full tour of, complete with the worlds highest pipe organ, it was 82 but I think I recall that it was 4 stories high, and if you have ever seen Salisbury, a massive cathedral, you can see where that is possible. Probably within ten or less miles of where he lives too. But those British cathedrals, I saw many, are amongst the most impressive buildings I have seen, and Westminster is doubtlessly the most historically important and imposing building I have set foot in. . And that burial spot of Edward the Confessor in there, and the stories or legends concerning it, totally wow man. Or the coronation chair with the 200 y.o. plus graffitti carved in it apparently by soldiers getting ready to go fight in the new US colonies, you could spend a lifetime investigating that place, doubtless some lucky historians job.Wells Cathedral was another real profound one. And some of those gravestone inscriptions, choice. Always thought the Moody Blues were a bit tame, if you get my meaning. I thought Days of Future Past was an OK album, although not having played it for many years as the vinyl is up in the loft, my perceptions of it as a body of work may be changed by a repeated listen sometime. Now if your talking of the original Fleetwood Mac, with Peter Green firmly in control, now there was an exceptional British band. yeah..Moodies= Rod McKuen....and when Tull gets categorized as even vaguely in the same bin due to perceived proginess, flute, trippy covers, still at it, whatever...it's a damn shame! Can't inagine the muzak guys even break a sweat changing the original 'Nights in White Satin' into to elevator ready muzak. Have a great concert folks. 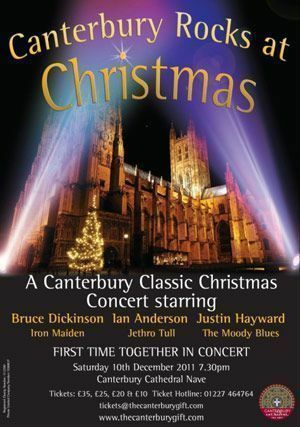 According to Blabbermouth.net, Iron Maiden's Bruce Dickinson will join Jethro Tull frontman Ian Anderson and Justin Hayward of the Moody Blues on Saturday, December 10 for what is being billed as "Canterbury Rocks At Christmas" in the nave at the famed Canterbury Cathedral in Kent, England in support of The Canterbury Gift, which raises money for renovation work on the cathedral. The 900-year-old Canterbury Cathedral, which is said to be one of the most important sites in Britain's Christian heritage, remains in need of urgent repairs, particularly to its 235-foot-high central tower, known as Bell Harry tower, its medieval stained glass windows, and its 19th-century lead roof tiles. More than £10 million has been raised in recent years but another £3 million a year must be found over the next decade. Speaking about why he had chosen to play last year's Christmas gig, Ian Anderson spoke of the importance of supporting Canterbury Cathedral. "If our generation and the future generations don't do it, then it will be lost," he said. "There is a real parallel regarding the preservation of our great buildings, and the greater sense of conserving our world. We need a huge change of thinking about the stewardship of our planet and all it contains, both natural and man-made." "Canterbury Cathedral is a place for life today. But it is also a place for the future and, whether you are a Christian or not, it is a place which should remain forever close to our hearts." Ian has added two date for the Concerts of Christmas in my country. 21 and 2 December. The gains come devolven in beneficence for precise wanting of the same Ian Anderson. The proceeds of the first evening, to the restoration of an ancient Church to Piacenza, while those of the second one, to Nave, near Brescia, towards humanitarian missions abroad . Great, isn't it ? Together with Ian, Florian and John O' Hara. An acoustic Concert. M.
Excellent. Look forward to reading your thoughts about the concerts. Sadly i am not sure to be able to see even one of that show, because I will see the concert at the cathedral in Manchester the 18 December, instead. But i will try anyway. Piacenza is very near our home. M.
It all sounds great M.
As someone who's never heard of those two places, have you any information on them you can share with us? So that's " I Believe In Father Christmas" sorted then. The acoustics at the Cathedral really suit the flute (no rhyme intended) Ian sounds magnificent. He became an institution with albums like Aqualung and Stand Up but Jethro Tull’s Ian Anderson is on a quest to look after a different part of British history – the nation’s churches. Chris Price caught up with him as he prepared to appear with Justin Hayward and Bruce Dickinson. After returning to perform at Canterbury Cathedral for a second successive year, you would be forgiven for thinking Ian Anderson is a Christian. That is where the Jethro Tull flautist and leader would politely point out you were wrong. “That doesn’t mean I am of the Christian persuasion,” said Ian, who has sold 60 million records in a 40-odd-year career as frontman of Jethro Tull. As the snow covered Canterbury Cathedral this time last year, the beauty of the building was brought out even more. Yet even if the white stuff does not fall when he performs this time, Ian has brought along two Christmas crackers to make sure he gets bums on seats: Iron Maiden frontman Bruce Dickinson and Moody Blues singer-songwriter and guitarist Justin Hayward will join him for the gig. The show is a big departure from the notoriously full-on style of all three and a rare chance to see them in an acoustic setting. “The important thing is to bring people in to the context of a place of worship,” said Ian, 64, who has now been playing in churches for the last couple of years in the UK and abroad. Justin Hayward is a man of faith and plays at his local church at his home in France. Although Ian and Bruce have only met a few times before, Ian understands the singer is a confident Christian but one who has “an open mind”. It is unsurprising that Ian has such an affinity with churches. His first awareness of music was church music, then just before his teens he listened to rock and roll and the blues before embracing folk, jazz and classical music in his teenage years. All of these influences then went into the success of Jethro Tull. The 1960s and 1970s rockers celebrated the 40th anniversary of their seminal album Aqualung this year, with EMI Records releasing a deluxe collectors edition of the record. Released in October, it came complete with new mixes and previously unreleased material. “It’s an album which touches all of the little moments of social awareness in my early years” said Ian. “A couple of the songs touch on organised religion. “I think it is timeless music and that it works well today. We can still play those songs. Leader and flautist of British rock band Jethro Tull. Also plays the acoustic and electric guitar, bass, bouzouki, balalaika, saxophone, harmonica. Received an MBE in 2008. Singer, songwriter, airline pilot, fencer, broadcaster, author, screenwriter, actor and marketing director, best known as the lead vocalist of the heavy metal band Iron Maiden. Best known as singer, songwriter and guitarist in the Moody Blues. Enjoyed international solo success in 1978 when he appeared on the concept album Musical Version of The War of the Worlds, which yielded the hits Forever Autumn and The Eve of the War. Please could someone post the set list. I am seeing Ian for the first time in Salisbury on Friday and would like some idea as to what he is likely to play. Really hoping for "A Christmas song", Another Christmas song" and "Birthday Card At Christmas"
Does Ian ever play "Ring Out Solstice Bells??" Ian's comments about God not being much of an interventionist seem to ring true, despite my boyhood hometown football team's recent succes in the hands of a God man ( Denver broncos/ Tim Tebow). I mean, if she (God) was paying attention she wouldn't have sabotaged the surprise guests with a chest infection and pancreatic cancer treatment. I haven't been with Ann Phoebe in the past few months ( or ever in my life)...so I'm gonna have to track down the dad and let him know who's who and what's what. You have a definite list there. I agree with most of what he said however I'm starting to open up a bit and not be so anti organised religion.